22 December 2000: Merry Christmas and a Happy New Year! 20 December 2000: Some years ago, the Paranal mountain was still a remote and inhospitable site, some 12 km from the Pacific Coast in the dry Atacama desert in northern Chile. Few aircraft passengers flying along that coast would notice anything particular about this peak, except perhaps that it was one of the tallest in the steep coastal mountain range. Already in the early 1960's, pioneer astronomers crossed this desolate region in search of suitable sites for future observatories. One of them, Jürgen Stock, did notice the Paranal peak as a possible candidate. However, without any water in this extremely dry area, how could any people, even hardy scientists, ever live up there? 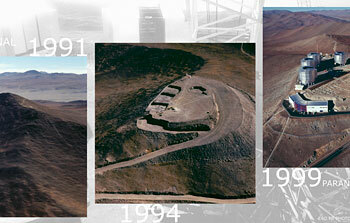 He then went on to discover La Silla, where ESO decided to build its first observatory in 1964. 20 December 2000: A fundamental prediction of the Big Bang theory has finally been verified. For the first time, an actual measurement has been made of the temperature of the cosmic microwave background radiation, at a time when the Universe was only about 2.5 billion years old. This fundamental and very difficult observation was achieved by a team of astronomers from India, France and ESO . 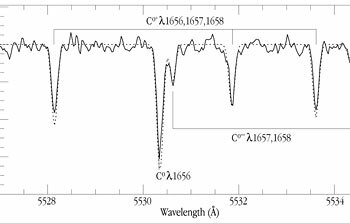 They obtained a detailed spectrum of a quasar in the distant Universe, using the UV-Visual Echelle Spectrograph (UVES) instrument at the ESO 8.2-m VLT KUEYEN telescope at the Paranal Observatory. 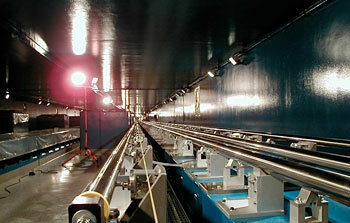 13 December 2000: Due to a happy coincidence, the ESO/ST-ECF Science Archive Facility is celebrating three different milestones at the same time: 1) its 10th anniversary since the establishment in 1991, 2) the 10,000th request for data, and 3) the signing-up of active user number 2000. This Archive contains over 8 Terabytes (1 Terabyte = 1 million million bytes) of valuable observational data from the NASA/ESA Hubble Space Telescope (HST), the ESO Very Large Telescope (VLT) and other ESO telescopes. Its success paves the way for the establishment of "Virtual Observatories" from which first-class data can be obtained by astronomers all over the world. This greatly enhances the opportunities for more (young) scientists to participate in front-line research. 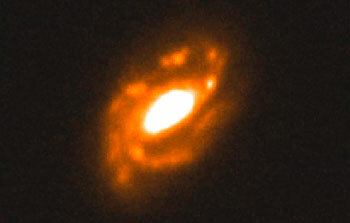 8 December 2000: The most massive spiral galaxy known so far in the Universe has been discovered by a team of astronomers from Garching, Padova, Leiden, ESO and London . They base their conclusion on recent observations with ISAAC, an infrared-sensitive, multi-mode instrument on ESO's Very Large Telescope at the Paranal Observatory. This galaxy has been designated ISOHDFS 27 and is located at a distance of approx. 6 billion light-years (the redshift is 0.58). Its measured mass is more than 1000 billion times that of the Sun . It is thus about four times more massive than our own galaxy, the Milky Way, and twice as heavy as the heaviest spiral galaxy known so far. 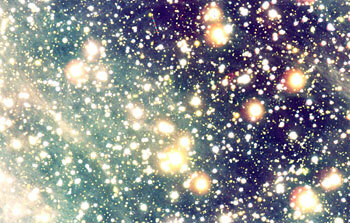 1 December 2000: An international team of astronomers  has succeeded in mapping the "dark" (invisible) matter in the Universe, as seen in 50 different directions from the Earth. They find that, within the uncertainty, it is unlikely that mass alone would stop the current expansion of the Universe. 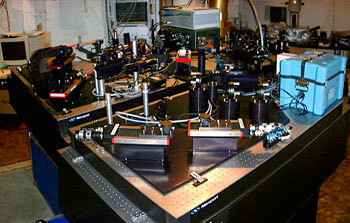 This fundamental result is based on the powerful, but challenging method of "cosmic shear". 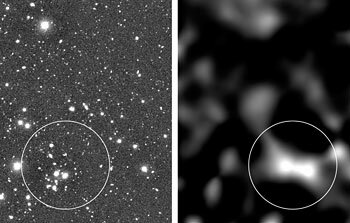 It depends on very accurate measurements of the apparent, weak distortion and preferential orientation of images of distant galaxies. This effect is caused by deflection of the light from those galaxies by the large mass concentrations in the Universe it encounters on its way to us. The larger these masses are, the larger are the apparent image distortions and the more pronounced are the alignments of neigbouring galaxy images. The new analysis was made possible by means of unique observational data, obtained under excellent conditions with the the ESO 8.2-m VLT ANTU telescope and the multi-mode FORS1 instrument at the Paranal Observatory. 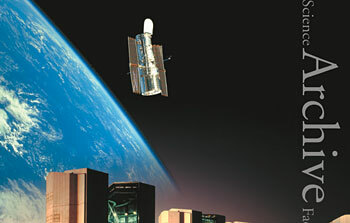 22 November 2000: The Particle Physics and Astronomy Research Council (PPARC), the UK's strategic science investment agency, today announced that the government of the United Kingdom is making funds available that provide a baseline for this country to join the European Southern Observatory (ESO). 13 November 2000: A few months from now, light from celestial objects will be directed for the first time towards ESO's Very Large Telescope Interferometer (VLTI) at the Paranal Observatory (Chile). 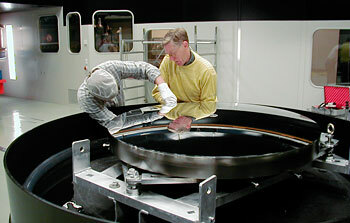 During this "First Light" event and the subsequent test phase, the light will be recorded with a special test instrument, VINCI (VLT INterferometer Commissioning Instrument). The main components of this high-tech instrument are aptly named MONA (a system that combines the light beams from several telescopes by means of optical fibers) and LISA (the infrared camera). VINCI was designed and constructed within a fruitful collaboration between ESO and several research institutes and industrial companies in France and Germany. It is now being assembled at the ESO Headquarters in Garching (Germany) and will soon be ready for installation at the telescope on Paranal. With the VLTI and VINCI, Europe's astronomers are now entering the first, crucial phase of an exciting scientific and technology venture that will ultimately put the world's most powerful optical/IR interferometric facility in their hands. 27 October 2000: A remarkable, wide-field infrared image allows to see in unprecedented detail the inner regions of RCW 108, a large complex of stars and nebulae in the southern Milky Way. It is one of the widest, "deepest" and most spectacular infrared astronomical images ever obtained of a starforming region. It is based on approx. 600 individual exposures with the SOFI multi-mode instrument on the ESO 3.58-metre New Technology Telescope (NTT) at the ESO La Silla Observatory (Chile). 26 October 2000: Four new moons have been discovered orbiting Saturn, raising the number to twenty-two. This means that Saturn is now the planet in the Solar System with most known satellites. The previous record holder, Uranus, has twenty-one known satellites. 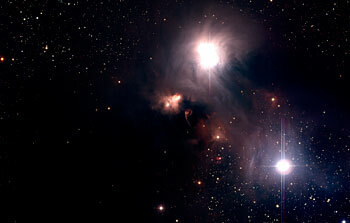 Two of the new objects were first seen with the Wide-Field Imager (WFI) camera at the ESO La Silla Observatory (Chile). They have diameters of 10 to 50 km, and calculations have shown that they are almost certainly small satellites (moons) that accompany Saturn on irregular orbits. 18 October 2000: Can you imagine how much physics is in a simple match of ping-pong, in throwing a boomerang, or in a musical concert? Physics is all around us and governs our lives. The World-Wide Web and mobile communication are only two examples of technologies that have rapidly found their way from science into the everyday life. But who is going to maintain these technologies and develop new ones in the future? Probably not young Europeans, as recent surveys show a frightening decline of interest in physics and technology among Europe's citizens, especially schoolchildren. Fewer and fewer young people enrol in physics courses at university. The project "Physics on Stage" tackles this problem head on. 17 October 2000: Observations with telescopes at the ESO La Silla and Paranal observatories (Chile) have enabled an international team of astronomers  to measure the distance of a "gamma-ray burst", an extremely violent, cosmic explosion of still unknown physical origin. It turns out to be the most remote gamma-ray burst ever observed. The exceedingly powerful flash of light from this event was emitted when the Universe was very young, less than about 1,500 million years old, or only 10% of its present age. Travelling with the speed of light (300,000 km/sec) during 11,000 million years or more, the signal finally reached the Earth on January 31, 2000. The brightness of the exploding object was enormous, at least 1,000,000,000,000 times that of our Sun, or thousands of times that of the explosion of a single, heavy star (a "supernova"). The ESO Very Large Telescope (VLT) was also involved in trail-blazing observations of another gamma-ray burst in May 1999, c.f. 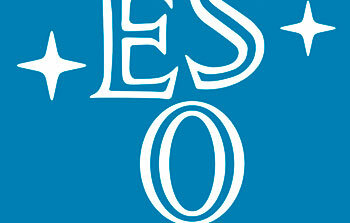 ESO PR 08/99. 13 October 2000: The following Press Release, now retracted, is kept on the web for information and historical reference. 11 October 2000: Less than one month after "First Light" for the fourth 8.2-m YEPUN telescope (ESO PR 18/00), another special moment occurred at ESO's Paranal Observatory. This time, it was the first truly "underground" event, in the 168-metre long Interferometric Tunnel that has been dug beneath the platform at the top of the mountain. As one staff member remarked on this occasion, it was something like "the first scheduled trip of the Paranal metro"! 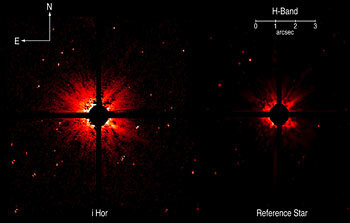 6 October 2000: The R Coronae Australis complex of young stars and interstellar gas clouds is one of the nearest star-forming regions, at a distance of approx. 500 light-years from the Sun. It is seen in the southern constellation of that name (The "Southern Crown"). Images of this sky area were recently obtained with the Wide Field Imager (WFI), a 67-million pixel digital camera that is installed at the 2.2-metre MPG/ESO Telescope at ESO's La Silla Observatory. 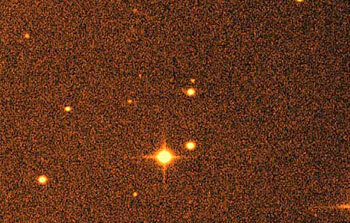 14 September 2000: Beautiful images of astronomical objects often contain a lot of scientifically interesting information - PR Photo 24a/00, shown above, is a fine example of this old maxime. 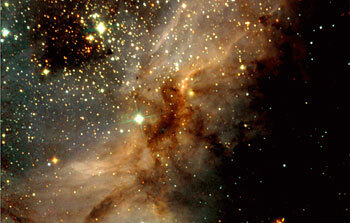 It provides a deep and unsually wide look into a giant star forming region in the Milky Way. It is known as Messier 17 (M 17), or the Omega, Swan, Horseshoe, or Lobster Nebula, because of its characteristic shape when photographed in visible light. It is located at a distance of approx. 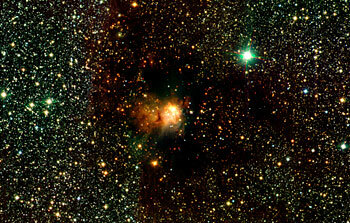 5000 light-years (1.6 kpc), and is seen in the southern constellation of Sagittarius (The Archer), near the main plane of the Milky Way. 11 September 2000: Deep inside the Milky Way, an old and lonely neutron star plows its way through interstellar space. 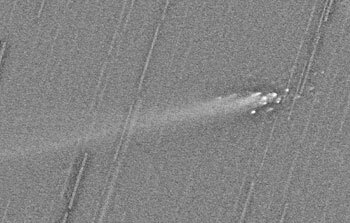 Known as RX J1856.5-3754, it measures only ~ 20 km across. Although it is unusually hot for its age, about 700,000 °C, earlier observations did not reveal any activity at all, contrary to all other neutron stars known so far. In order to better understand this extreme type of object, a detailed study of RX J1856.5-3754 was undertaken by Marten van Kerkwijk (Institute of Astronomy of the University of Utrecht, The Netherlands) and Shri Kulkarni (California Institute of Technology, Pasadena, California, USA). 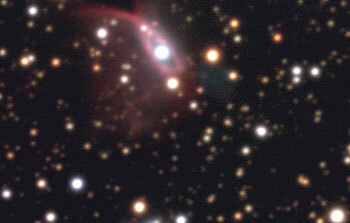 To the astronomers' delight and surprise, images and spectra obtained with the ESO Very Large Telescope (VLT) now show a small nearby cone-shaped ("bowshock") nebula. It shines in the light from hydrogen atoms and is obviously a product of some kind of interaction with this strange star. 4 September 2000: It was a historical moment last night (September 3 - 4, 2000) in the VLT Control Room at the Paranal Observatory , after nearly 15 years of hard work. Finally, four teams of astronomers and engineers were sitting at the terminals - and each team with access to an 8.2-m telescope! From now on, the powerful "Paranal Quartet" will be observing night after night, with a combined mirror surface of more than 210 m 2. And beginning next year, some of them will be linked to form part of the unique VLT Interferometer with unparalleled sensitivity and image sharpness. 28 August 2000: These days, the ESO staff at Paranal is having a strong feeling of "déja-vu". Only seven months after the third 8.2-metre VLT Unit Telescope, MELIPAL, achieved "First Light", this crucial moment is now rapidly approaching for YEPUN , the fourth and last of the giants at the ESO observatory. 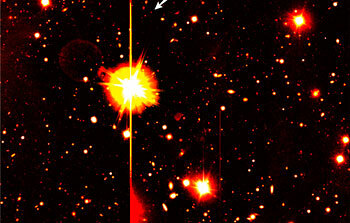 The VLT Observes Comet LINEAR's "Shower"
8 August 2000: In a textbook example of useful collaboration between ground- and space-based astronomical telescopes, the ESO Very Large Telescope has imaged the "shower" of "mini-comets" in Comet LINEAR, first seen by the Hubble Space Telescope (HST) a few days ago .